Note: We'll be releasing a new hero shortly and we wanted to post this a little early to make sure players are prepared! The story of how High King Valkin came to be the ruler of all the Dwarves is a tale of tragedy and rebirth. Born to the Frost Dwarf Clan, Valkin had to lead his people from an early age. During the first Goblin War the Storm Dwarf Clan led the main united Dwarf campaign against the Goblins. In the final battle, the Storm King fell and all seemed lost, until Valkin dove into the thick of the goblin hordes without hesitation and attacked their forces with powerful attacks. This brave action inspired the other Dwarf Clans as they fought back the Goblin Menace. The other elemental Dwarf Clans followed him without hesitation during the battle and under his leadership, they managed to shatter enemy lines and force the goblins to retreat. It was a grand victory for the Dwarf Clans but it came at a price. With his last words, the critically injured Storm King anointed Valkin as the High King of the Dwarves, uniting all of the Dwarf Clans under one rule in this dark time. Cruel King Bramble – Valkin and the other Dwarves are currently at war with the Goblin tribes, and their leader has proved himself to be a powerful adversary to Valkin. PERFECT SWING – Attacks cannot be dodged or missed. ARMORED – Takes less damage from Physical Attacks. FEAR IMMUNE – Immune to Fear effects. TO WAR (ARTILLERY) – Ranged Water Attack on all enemies that has a chance to Freeze. DWARF FERVOR – Increase ATK + DEF for each Dwarven ally by 10%. TO WAR (INFANTRY) – A battalion of Dwarves charge, dealing Melee Physical damage to all enemies and Hastes Allies. STEEL SHARPENS STEEL - Buffs allies ATK + CRIT. Switches 'To War' to Infantry. DWARF FERVOR II – Increase ATK + DEF for each Dwarven ally by 20%. LEAD BY EXAMPLE – Gains a chance for an ally to attack the same target on a basic attack. TO WAR (CALVALRY) - Melee Physical biting attacks that fears all enemies and buff DEF of Allies. TOOTH AND NAIL - 2 Attacks on one enemy and all Dwarven allies will attack the same target. Switches 'To War' to Calvary. any tips for which portal it will be ? Hoping he's not the first legendary to be stuck in the VIP portal though >.< Ain't nobody got the gems for that! Is there any healers involved? Other than Dagrund. Because as much as we all adore him, my particular Dagrund tends to die if you look at him sideways. @Joveth - can you tell us how the prize unlock works for those that won that? Will he be in our game straight away? I guess we cant pull on the portal until he is loaded into our roster?? Well, we can but it might negate the prize...? My I add, the character art looks amazing. Please tell the design team they've done an amazing job! ie, if I unlock him myself, do i get 35 tokens for the prize and does he come FA'd like Kozar did when people won him? I wana unlock him so i can play around with the team so would really appreciate a heads up @Joveth . The status effects from "To War" appear to change from freeze, to haste to fear as the hero goes through ascensions. Or is it more complicated than that? It's complicated. The other abilities set the "To War" type. When I saw this hero first it gave the impression of a light hero, with all the yellow and gold. Was shocked when I looked at the portal and saw he was water hero. Seemes like effect of To War only changes after you have used one of the other to abilites in battle. Meaning he will start every dungeon with the freeze effect. Then after using for example Steel Sharpens Steel, it will shift to haste. That's how I interpret it. I just got him by my worst 10x summon ever with two purple chests and no unlock and now I don't even have all the water evos to ascend him... But it's still nice cause he's a freakin' dwarven king I guess. Ok - got the mail. 100 tokens for the unlock...so that's how it works. Awesome! THANKS!! Any word on how long the Viking Dwarf will be hanging around the portal-that-rhymes-with-cenozoic (mesopolagic, bathyal, abyssalpelagic... oh wait - wrong category)? Any word on how long the Viking Dwarf will be hanging around . . . ? I'm a huge goblin fan myself so I would gladly like another on the roster, but I consider Kozar kinda sorta on #teamgobbo. He's sort of like the cousin Eddie of the family. wait, are you the 5th goblin? Health looks low. My 3star Kai has 5322 health at lvl 66. 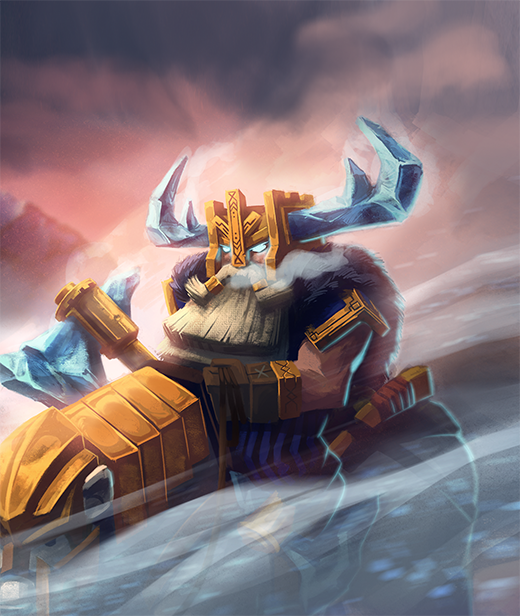 Since High King Valkin is a legendary dwarf, does that mean a legendary dwarf team with synergies and stuff will be created? The dwarf king is definitely interesting but the other dwarfs do not have any of the synergy style abilities of the undeads or the goblins and the team falls apart pretty quickly when used on anything hard.